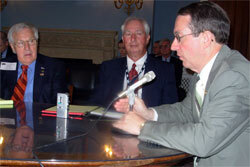 Only when someone like House Ag Committee Chairman Bob Goodlatte talks do farm broadcasters listen. I didn’t get to attend the NAFB Washington Watch this year but thanks to Executive Director, Bill O’Neill, we’ve got pictures. According to the latest NAFB eChats they’ve got a new qualitative farmer media use study out that says farmer use of iPods and other digital audio devices has grown to about 5 percent! This seems like pretty fast growth to me when you consider that they didn’t even exist just a couple years ago. I guess it’s kind of like radio back when it got started. How many farmer had one in the first 2 years? Was it 5 percent? The NAFB Foundation is a great program because it’s all about the future and helping the young people who will be a part of that future. It’s the kind of program I wish all organizations had. We have always supported it. Here’s who will be receiving grants from the foundation to help with their internships this year. The farm broadcasting members of NAFB posed for a picture after the media reception. The deadline is coming up if you want to advertise in the 2006 NAFB Directory. The deadline for materials is February 22. I have no motivation or inspiration to do a year in review so I’m glad that others are taking care of these duties. I guess I think that if anyone wants to know about the year at AgWired they can just scroll down!